Omni 640 Blue 14 Day Masking Tape is a paper tape that is pressure-sensitive and can be used to mask surfaces on walls, floors and other areas while painting. The masking tape has a premium quality acrylic solvent adhesive. This masking tape can be removed 14 days after its application and surface remains residue-free. This is were the name of ’14 day’ masking tape come from. The Omni Blue 14 Day Masking Tape has been designed for outdoor application with high resistance to extreme weather conditions such as exposure to sun or moisture. The 74 g/m² backing of UV resistant waterproof of saturated paper gives 14 Day Masking Tape it’s outdoor durability. This high tensile masking tape is stretchable up to 8%. 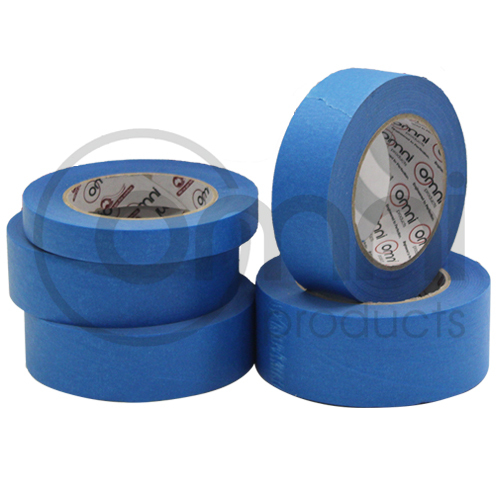 The Blue 14 Day Masking Tape is available in a number of different sizes. Omni has inhouse tape slitting machinery so masking tape can be custom made to any required width. Manufactured in Italy, Omni’s General Purpose Masking Tape is premium quality and has been engineered to perfection.